Now you can accurately measure parent perceptions and find out how to better meet parent expectations using the Ruffalo Noel Levitz Parent Satisfaction Inventory, a parallel, companion survey to the four-year college and university versions of the Student Satisfaction Inventory™, Form A and Form B.
Identifies issues that are highly important to parents, including how parents feel about the campus climate, instructional effectiveness, financial aid, student support services, and academic advising. 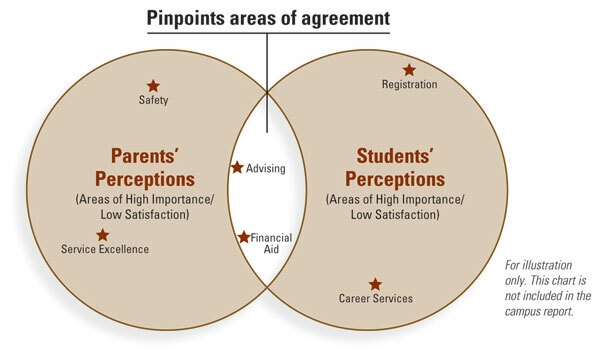 Identifies perceptions that students and their parents do, and do not, share in common (see illustration). Equips you to implement new strategies for parent relations and to re-focus existing parent and family programming and communications on priority concerns. Benchmarks parent satisfaction against national norms for four-year colleges and universities. The Parent Satisfaction Inventory is designed for the parents of currently enrolled undergraduates at four-year colleges and universities. Learn how to administer the Parent Satisfaction Inventory by reading these frequently asked questions and implementation guidelines (PDF). If you have any questions about how to move forward with the Parent Satisfaction Inventory or how Ruffalo Noel Levitz can help you interpret the data you will receive, please contact us. Read the responses from a nationwide survey of parents of college students.